Horizon Grill excites the downtown dining scene with an Asian approach to familiar Western favourites. Pair that with an amazing view of the city and you've got a worthy new addition to sky dining. 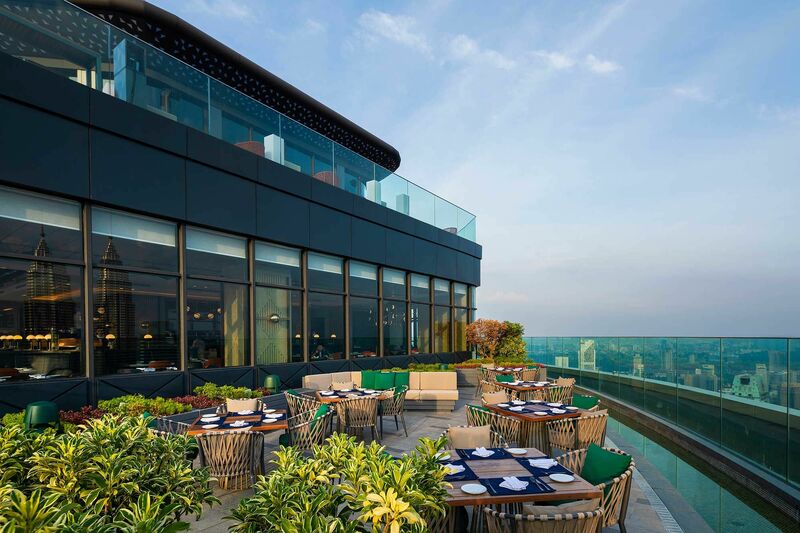 Located on the 58th floor of Banyan Tree Kuala Lumpur, Horizon Grill is the hotel's brasserie, serving a hearty breakfast spread, executive lunches and gourmet dinners with a gorgeous view of the Kuala Lumpur skyline as its backdrop. As its name suggests, the restaurant's star is a Santa Maria-style grill, used to create consistency in doneness and flavour when it comes to cooking up fresh seafood and high-grade dry and wet-aged beef. Restaurant goers can either dine in a stylish modern interior or go al fresco to enjoy an unhindered view of the city. Angus hand cut steak tartate, tapioca chips, marinated fresh black peppers, shallots, capers and wakame make up this dish. Surprisingly lightly spiced, thanks to a sprinkling of shichimi (Japanese seven spice), with a soft beef lull, the meat is tender and creamy with an almost milky feel to it. The taste itself isn’t very bold but rather mild, allowing you to take your time to savour the beef and the flavour profile of the dish. What's not to love about a good seafood bisque? Made of mud crab, flower crab and lobster, this soup has a rich crustacean blast that really lingers on the palate. While not overly bold and complex in the flavour department, it is very pleasant and amazingly light in composition at the same time. The addition of salted lemon peel adds a much desired zestiness to counter the dominant briny elements. Rich, fresh and oily, this dish surprisingly doesn’t leave you with an overly bold aftertaste. This is probably thanks to the star fruit and passion fruit compote that helps to cut through the fattiness of the dish. The inside is soft, with an almost raw delivery in the mouth, while the outside is pan seared to seal in the flavours. The micro cress salad and inclusion of duck jus do little to steal the show away from the foie gras, which depending if you're a fan of this French delicacy or not can result in a make or break moment for you. Half dry-aged and half wet-aged, Japanese beef is grilled and served with kalamata purée, parsley purée and mixed herb salad before being drizzled with beef jus. Arguably our favourite part of the meal, both types of beef were fatty, juicy and well seared. The beetroot and parsnip add a fresh light green touch to the fatty flavourful beef, while the beef itself is a bit chewy, made more pronounced by the high fat content. The wet-aged beef has welcoming bursts of salt and pepper interspersed throughout, leaving your mouth feeling oily and full. The aged beef however, is gamier but has a lovey aged character that lingers on the mouth. Sweet with a nice cinnamon tinge. This soft apple pie is slow cooked, layered for texture and comes in a nice petite size, perfect after six courses. Paired with a dollop of vanilla ice cream, it hits all the right flavour notes, making it a short and sweet ending to the meal. Horizon Grill's secret sauce is twofold: a beautifully decked dining space and cuisine that has plenty of potential to be a promising permanent addition to the KL dining scene, thanks to its understated approach to modern dining. If you're looking for a new place to do date nights, this might just be it. For more information, visit the restaurant's official website or call 03 21131821.